Ozone is a very interesting gas that is often present in the vicinity of electrical arcing. It has a very distinctive smell and that's why it's name was derived from the Greek word ozein which means "to smell". It is a strong airborne oxidant that can be used to freshen the air by destroying atmospheric germs and odours, care must be taken with the quantity produced though, since levels that can be smelled are capable of causing irritation to sensitive areas of the body like the eyes and nose. Because of it's strong odour destroying properties ozone is often used to freshen the air in public facilities and can be used to reduce the smell of smoke damage in a building, or bubbled through water to provide a more effective sterilisation than chlorine without any residual taste or smell. It's most notorious use must be for the suppression of the smell from cannabis plants in illegal growing rooms. It's very easy to make ozone, since it is done by applying Ultra Violet energy or electrical discharge energy to either pure oxygen, or more commonly just plain air. The energy of the UV or arc causes the two atoms of a molecule of oxygen to separate, and some recombine temporarily in an unstable three atom molecule of ozone. The third oxygen atom is quickly donated to anything in the vicinity and oxidises it in the process. Ozone must be made on demand since it cannot easily be stored. Here are three approaches to making ozone. The first is a simple low level ozone maker which is ideal as an air freshner while the second is a UV technique. The third is a planar plasma technique which can produce a lot of ozone. Here's a simple unit for creating low levels of ozone on a continuous basis. It's a very reliable design and has a few rather unique features. The hand in front of the unit is to indicate it's size and also indicate that quite a strong electronic draught comes from the front despite the unit having no moving parts! Here's how it works... A voltage multiplier like the one on the ioniser page is used to apply a high negative voltage to a needle. Unlike an ioniser which projects ions straight into the air, this unit is encouraged to emit ions by having a short metal tube at the opposite potential placed in front of the needle. This causes a strong corona to appear at the needle tip, and the high volume of ion discharge over to the tube causes a strong airflow which carries ozone from the needle tip corona out into the room. The schematic above shows a couple of resistors between the power supply and the tube. This is to avoid having the tube at mains potential when the circuit is used with a mains powered voltage multiplier. This unit was bodged together experimentally, and uses a 30 stage 220n mains powered (240V) voltage multiplier which has been split into sections to save space. There's more information on these multipliers on the ioniser page. The connections between the sections of voltage multiplier are just thin hookup wire, since the potential between stages is relatively low at a few hundred volts. The output goes via the usual safety resistor/s and also passes through a neon and capacitor based current flow indicator as used on the ioniser page. The final output is on three needles pointing at three short tubes made from brass eyelets soldered to self adhesive copper tape. The tubes are all conected to mains neutral via a few safety resistors. Here's a close-up view showing the emitter and tube, and also the neon output level indicator. 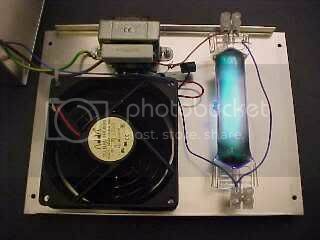 This is an experimental ozone generator based on a mercury discharge lamp. It has a fan and uses a resistor to limit the current through a quartz tube mercury discarge lamp which has been removed from a commercial mercury vapour lamp. It must be stressed that without the glass envelope of the lamp to act as a filter, the quartz tube passes the more harmful ultraviolet wavelengths which CAN CAUSE EYE DAMAGE and sunburn. Even though the tube in this design was operated at a very low current, it was still shielded completely in a metal case to prevent anyone from staring at the lamp and suffering possible eye damage. The design certainly produced ozone, but I think I'm under-running the lamp to the point that it has blackened inside quite severely, although running it at a higher current briefly might help clear the blackening. I might re-visit this project at some point. 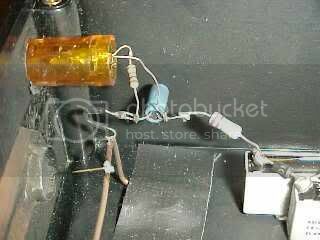 To help the mercury tube strike, a resistor of about 220K should be wired between one end of the tube and the little auxilliary electrode at the other end. 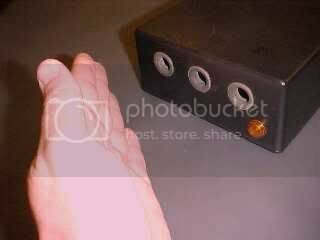 The tube MUST be in series with a resistor or choke to limit the current through it. Here's the really violent way to make tons of ozone. 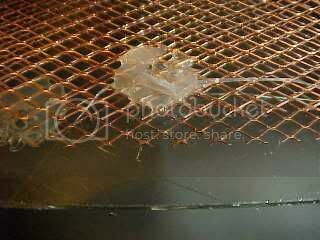 It's basically a thin piece of glass with metal mesh stuck to both sides. When about 5kV is applied to the meshes, a large area corona discharge occurs between the mesh and glass on both sides. This makes a LOT of ozone. 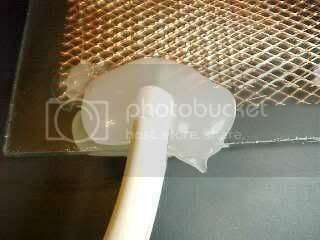 The mesh is tacked to the glass at regular intervals by squirting hot melt glue directly through it and onto the glass. 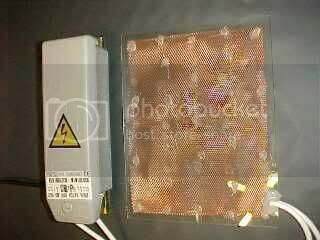 Silicon would probably stick better and withstand the oxidising effect of the ozone, but hot melt is much easier. The mesh must be cut smaller than the glass to avoid arcing at the edges, and it must be tacked frequently while leaving a small gap between the mesh and glass to allow airflow through the corona. If it is tacked too far apart it will buzz noisily when powered up. 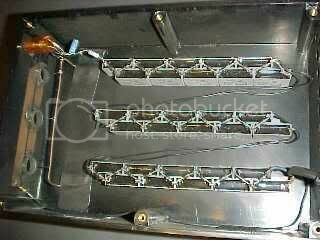 The neon transformer wires are attached directly to the metal mesh which should be stainless steel to avoid oxidation problems. I used copper mesh since it was freely available in the prop-shop where it is used as a malleable form for clay structures. I've really gone to town on tacking the wires down with hot melt glue, although in hindsight if I had attached the wires centrally along one edge, the whole panel could have been suspended from the ceiling by it's wires. I suppose silicon would be better for this bit, since it would definitely adhere to the glass better for hanging. The unit makes a soft FRRRRRR! noise while powered, and a very faint corona discharge is visible in a very dark room. The current involved is very low with an A4 sized panel passing about 1mA at 5kV. 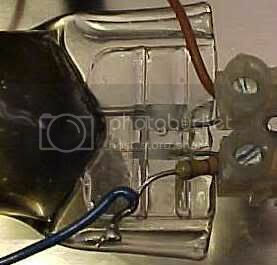 The reason for the glass is as a barrier between the mesh electrodes. If it wasn't there they would just arc across noisily, however with the glass in place the whole arrangement turns into an air and glass dielectric capacitor, and the controlled charge transfer across the air (corona) splits the oxygen into ozone. 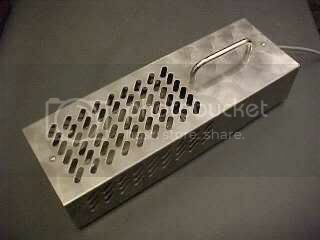 Here's a commercial British ozone generator that is often found in public restrooms as an air sanitizer. The fact that it uses no chemicals, and genuinely destroys airborn bacteria and odours means that it is a cost effective alternative to traditional air freshener sprays and gels. Just fit and forget. The round electrodes are very smart and robust, and the tubular arrangement gives the mesh rigidity which reduces noise to a faint fizz. The transformer at the right hand side is a continuously rated 5kV boiler ignition transformer with one end of the 5kV secondary grounded internally. It's HT output is connected to the corona tubes by terminals at their ends. The electrodes couldn't be simpler. A scroll of stainless steel mesh is pushed into a Pyrex test-tube where it unfurls against the walls and a lug on the end makes connection to the circuit through a nut and bolt through the screw-on lid. 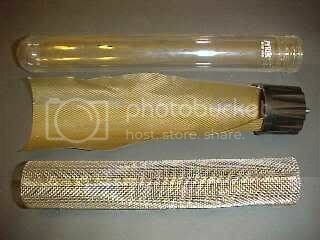 A stainless steel mesh tube on the outside of the test-tube acts as the other mesh electrode and is connected to ground via the terry clip mountings that hold the assembly in place.